Well, my manicure today might look amazing -- but that's probably the only part of me that does. I went to Pittsburgh this past weekend to visit some friends and happened to slip on the ice on Friday night. (I leave the cold for four months and apparently completely forget how to be in it.) I am currently laid up in the hospital awaiting surgery as I broke my ankle in TWO PLACES. I'm going to be off my feet for about 4 months. Yep, when I do something, I do it right! At least in the meantime, my dotticure nail art with Rescue Beauty Lounge Ah, Oui and Zoya Magical PixieDust Cosmo nail polishes is on point. Zoya Cosmo set against Rescue Beauty Lounge Ah, Oui. In other words? Perfection. My general clumsiness aside, I am actually really loving this manicure. 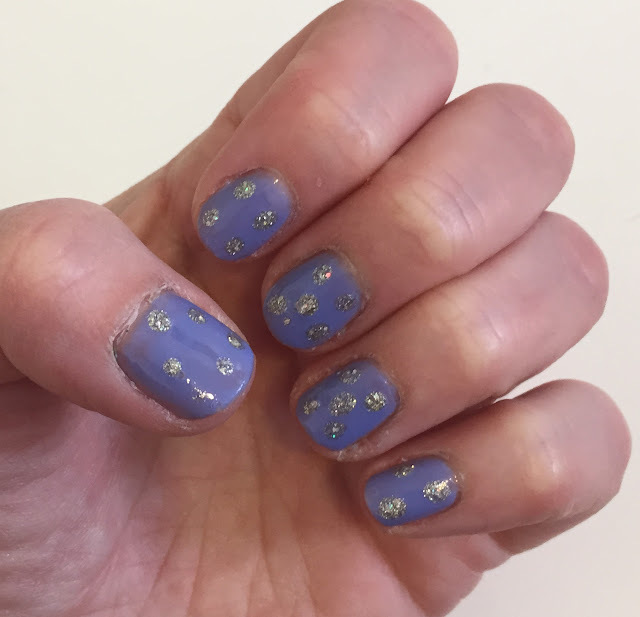 I painted my nails the day before I left Pittsburgh (Thursday) and as of today, they are still in perfect condition -- no chips! Now, maybe that's because I've been lying in a hospital bed for two days and not doing much of anything, but still. Pretty impressive. 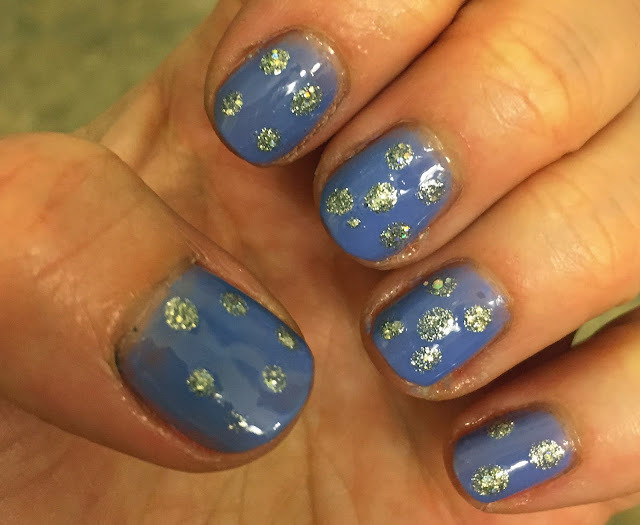 This is definitely a manicure that's getting noticed by everyone around me, too! My nurses and doctors have been complimenting this manicure nonstop. I have to say, I really love the color combination. Rescue Beauty Lounge Ah, Oui. 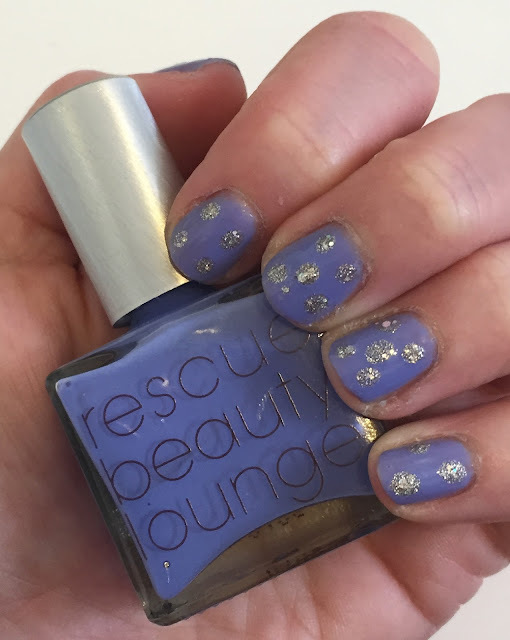 Rescue Beauty Lounge Ah, Oui is a beautiful dusky periwinkle/violet hybrid. It's incredibly glossy and creamy, with perfect color delivered in two coats. 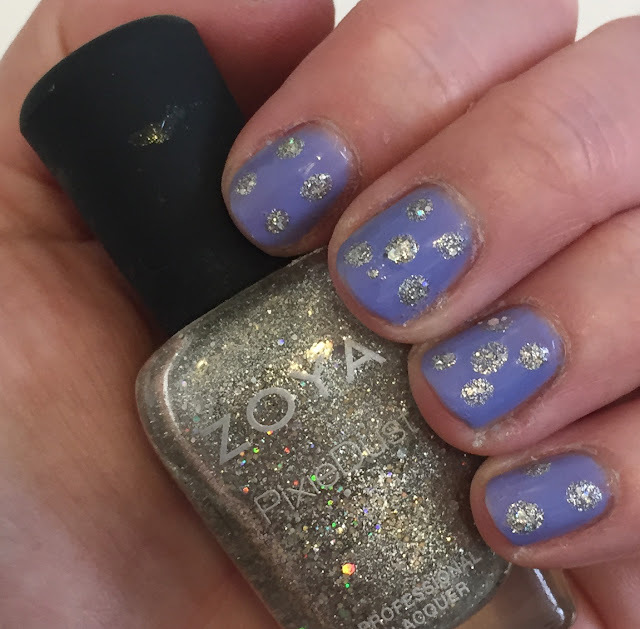 Zoya Magical PixieDust Cosmo is a sparkle-laden, glitter-bombed silver that reminds me of crushed diamonds. (For my full review on this polish, click here.) I poured this color out onto a plate and then used a dotting tool for the ultimate in polka dot precision. 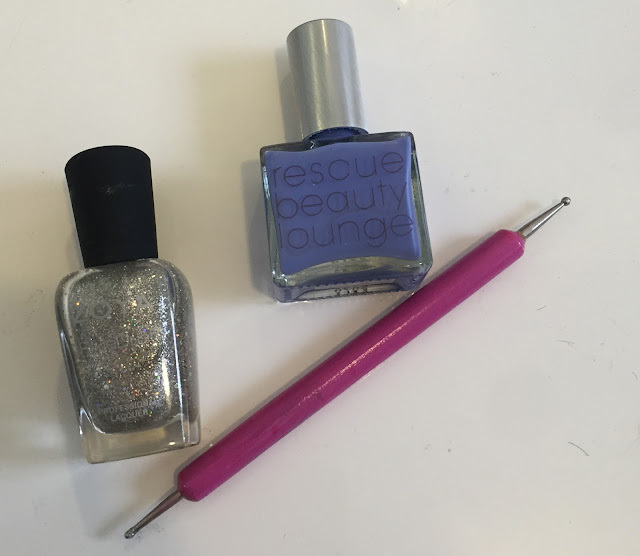 I used this dotting tool from Ricky's to gently place Zoya Cosmo polka dots on top of Rescue Beauty Lounge Ah, Oui. The two colors together? Simply put, they're perfection. I love the way the silver glitter sparkles against the rich purple. I decided to do different numbers and combinations of dots on each nail -- somewhere between 3 and 5 for each -- and just let the colors speak for themselves. The bottom of the Rescue Beauty Lounge Ah, Oui bottle. The bottom of the Zoya Magical PixieDust Cosmo bottle. I seriously can't get enough of my nails. And that's a good thing, since it looks like I might be stuck with this manicure for awhile! In all seriousness, I may not be able to post too much in the coming weeks depending on what's happening with my ankle. I'll still try to post as much as possible, but please bear with me as I go through a bit of upheaval and know I'll be posting as much as I can!